A donkey who was travelled and ‘stabled’ overnight in the back of a transit van has been rescued. Delilah, as she has been named, was found fly-grazing at various locations around Middlesex including a supermarket car park and outside of a doctor’s surgery. World Horse Welfare Delilah came to her rescue and Delilah is now in the care of World Horse Welfare’s Glenda Spooner Farm Rescue and Rehoming Centre, enjoying a much more traditional donkey life as she undergoes rehabilitation. World Horse Welfare Field Officer Nick White, who had previously attempted to advise Delilah's owners said: “The first time I was alerted to Delilah, she was less than a year old, very frightened and living overnight in the back of a transit van which she had to jump up into. "The van had no ventilation and only rags on the floor with no fresh air and would have been very cold during the winter nights. "During the day she was tethered in the car park of a DIY superstore near Heathrow and her owners would not be parted with her, despite my offers to take her into the charity’s care. “I continued to monitor her condition and saw her in a number of different locations. On a visit one day in March, Delilah was clearly exhausted and lying on the grass outside of a local doctor’s surgery with no water. 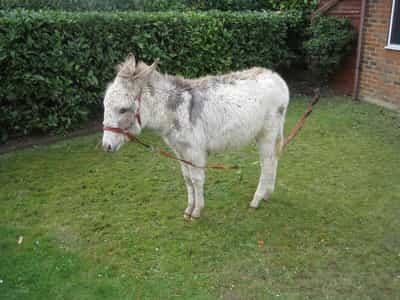 "This is clearly not ideal for any equine, but particularly for donkeys who rely so heavily on companionship and at such a young age too. I knew we had to try and get her out of this situation. “I met with the people who had been caring for her and it became apparent that her previous owners had moved on, leaving Delilah behind and with no provisions for her care. "Her current carers were about to be evicted and could not take Delilah with them so they gladly signed her over into World Horse Welfare’s ownership. "Delilah was then transported to our Glenda Spooner Farm Rescue and Rehoming Centre where she has since been undergoing rehabilitation and learning all about what the life of an equine should be. Delilah has been thriving in her new life at World Horse Welfare and is enjoying making lots of new friends with the various horses and ponies at the Somerset Rescue and Rehoming Centre. Delilah’s friendly nature and good looks have already proved a hit with visitors to Glenda Spooner Farm and a recent competition to find a fitting name for this furry donkey had over 100 entries. The winning name was suggested by visitor Kate in honour of her daughter, Delilah, and an official naming ceremony is soon to take place.